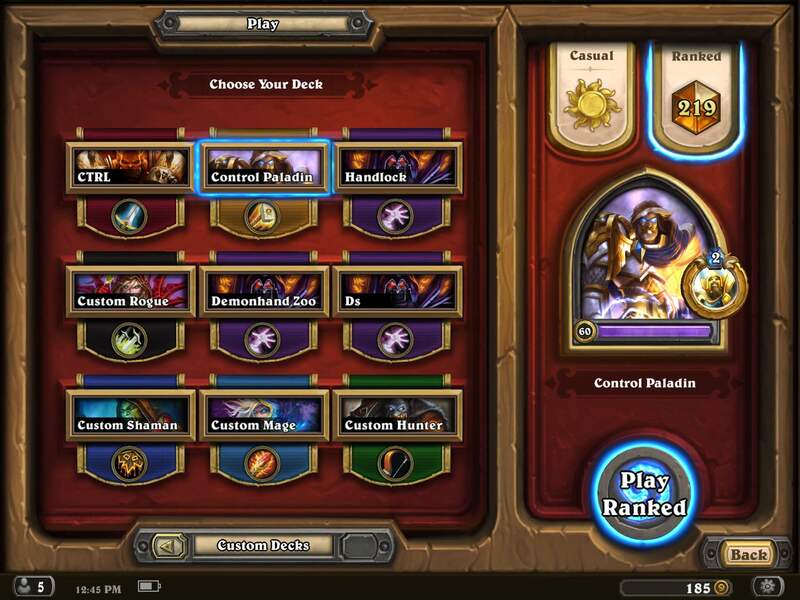 I just hit legend with a control paladin deck so I thought I’d do a write up on the deck and the ladder this season. I started off laddering this season with Kolento’s demon lock (aka demon hand zoo). It’s a cool deck but I found it was a bit inconsistent and it felt like often you just didn’t draw the right cards, and in particular you needed to find the board clear to beat mech mage. At around rank 7 I switched to the control paladin linked above and made it to legend really easily. I mainly play on my ipad so I didn’t track stats, but I think I would have had around an 80%-90% win rate. 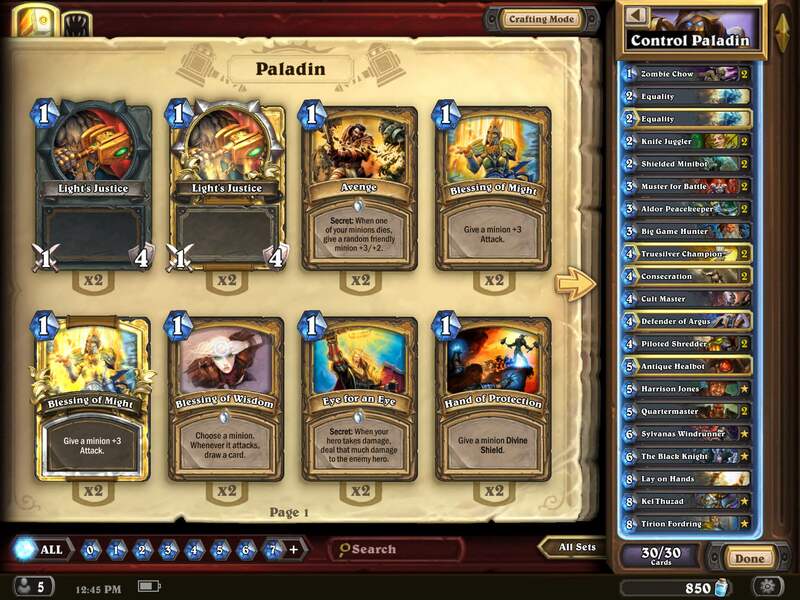 I took my idea of the basic mid range paladin concept that was around at the start of GVG and modified it into the deck above. My basic strategy for this deck is to fight for board control, put down consistent pressure, and either run the opponent out of answers then kill them with the board, or play slow, answer their turns, and run through their whole deck and win in fatigue. You have great early game with all the 1s, 2s, and 3s and can often beat aggro at their own game early. My general thoughts about the deck is that it shows the difficulty in distinguishing between control and mid range paladin. The deck is pretty clearly in the ‘control’ camp with the zombie chows, lay on hands and Kel Thuzad. I also ran several ‘answer’ cards like double equality, black knight, harrison and BGH. However, there are a few classic mid range cards there, including knife jugglers, a defender of argus and a cult master. Defender of Argus won me many games and i would never cut it. You’ll see it’s my only source of taunt apart from Tirion, and also the only way to check for black knight before playing Tirion. Zombie chows are a card I tried to cut at one point, but they’re just too good for my general strategy of taking early board control. They’re particularly strong against mech mage because they help you fight for the board early, and also give you a mirror entity trigger. Knife Juggler. I think this is a mid rangey card that doesn’t really fit with the deck that well. I cut them at one point and replaced them with higher mana cards, but I didn’t like the effect on the curve. When I decided to use another two 2 drops I really couldn’t find anything better than the jugglers. They do synergise well with equality and muster for battle, but I rarely got value from this. I don’t like wild pyro because there aren’t enough spells in this deck and anti-synergy with muster. A special note is that it’s one of the Paladin’s few ways to do 3 damage early so it’s good against the priest girl 1/3 and the threat of acolyte from warrior. Cult master can be criticised as a ‘win more’ card. I think this is the most questionable card in the list. It won me quite a few games where i traded a bunch of dudes and drew 4-5 cards, often with equality. It can also be used to counter a whirlwind effect threatening your dudes (for example, you have a bunch of 1/1s and fear whirlwind, play cult master and they won’t want to, particularly good if behind a taunt). But that’s a pretty specific situation. Ultimately I didn’t cut the card because I was had a super high win rate and was too superstitious to mess with the deck. Loatheb. Initially I didn’t include this because I figure it’s not that good against minion heavy decks I was seeing at the start of the season, particularly mech mage, mech shaman and hunter and paladin. However, with the current dominance of oil rogue and combo druid it makes a lot of sense. I felt these matchups were the closest for the deck so teching against them would make sense. This should probably replace the cultmaster, but as I mentioned, I didn’t make that change because I was winning a lot anyway. Kelthuzad. Great card and won me many games. Avoids BGH and synergises very well with my late game legendaries of Sylvanas and Tirion. It’s a pity the quarter mastered dudes lose the buff. A favourite play of mine with Sylvanas on the board is equality to make Sylvanas die against their board, trade sylvanas in a way they didn’t expect and take something, then play Kel Thuzad and get the Sylvanas back. Dr Boom. I actually don’t have this card and i haven’t crafted it because i think 0 bgh targets is best in this meta. I also hate the fact it’s in every deck. Balance please Blizzard. It obviously would work though, and would synergise well with Kel Thusad and cultmaster. Acolyte of Pain was big in Strife Cro’s win streak paladin, and present in most paladin decks I saw. I just don’t think this card fits in the deck at all. The only argument for it I can see is synergy with aldor peace keeper, but I don’t think that’s enough. Sludge Belcher is a major difference between my deck and other paladins. I don’t run it because I just don’t have space for it, and as discussed below, my strategy is to board control against mid range and race against aggro, so I felt I can do without the taunt. The Black Knight I definitely think TBK is important because it’s almost the difference between Ramp Taunt Druid being favoured or unfavoured just by itself. Harrison Jones is okay against warrior and rogue, but not that good because you don’t usually hit a very high value target with it. Harrison is great against paladin and mech shaman. Rogue normally only uses the daggers, and often buffs up the weapon and then blade flurries on the same turn, meaning you never get the chance to destroy a buffed weapon. Still, it’s reliably draw 2 cards and waste 2 of your opponents mana destroying the unbuffed dagger, and sometimes they get greedy and leave you a 9/1 dagger or something to catch with it. Warrior usually uses 1 charge of a 2 charge weapon immediately, so it’s destroy 1 charge and draw a card, which is good but not amazing. Against mech shaman it’s great since you can usually deny the deathrattle effect that buffs a mech while taking a charge and hurting their tempo. Against paladin you can often draw 4 cards from a muster light’s justice which can be truly game breaking. So my strategy for this deck with most matchups was to fight for board control early and basically run my opponent out of answers while healing myself and drawing cards. You can go late against most decks, and against decks like Priest and Warrior you need to make a choice about whether you try to get ahead early and kill them, or play slower and win the long game. This can change depending on your draw and theirs. The mulligans are basically look for zombie chow, juggler, shielded mini bot and must for battle. With the coin I sometimes keep an aldor or piloted shredder if the other cards are solid early minions. Otherwise I’d sometimes keep a tech card against certain classes, as noted below. Early in this season it was mostly face hunter, now there’s a lot of mid range. You’ll see I run almost no taunt in my deck and might expect I’d have trouble against aggro hunter. I actually had a pretty good win rate against them. My strategy is to try and get board control on about turns 1-3 and then I usually just race them. If they ignore my board, quartermaster, cult master, consecration or argus can punish them hard. If they trade with my board they often just run out of steam and lose. In mulligan I’d consider keeping defender of argus and the heal bot. Mech mage was usually a free win. Just standard mulligan for early drops and fight for and get board control. Hopefully draw some heal to keep out of double fireball range mid game. Often they overextend into equality consecrate. I found this to be my only 50/50 match up. I won often enough not to tech in loatheb. My approach was consistent pressure and hit face a lot while keeping the board clear. Harrison helped a lot . I won or lost most games by a few hp either way, and a few games the rogue milled himself and ran out of damage to kill me. Mulligan: keep harrison. There are a lot of combo druids now. Tough match that seems to heavily depend on their draw. They have trouble dealing with a bunch of mid health minions, so I’d try to build that sort of board. My deck was designed in part to counter taunt ramp druid with the double equality and black knight, and it did this well. Mulligans against druid – maybe keep an equality or black knight, keep a peacekeeper if you can in case they innervate out something stupid early. Easy match. You know you will win if it goes very late. Keep healing for after alexstrasa. Consistent pressure and they have trouble answering it, but don’t overextend into brawl or whirlwhind shenanigans. I like to keep a true silver so that if I play a turn 2 minion I can answer an acolyte of pain with coin truesilver. On the draw I usually skip making dudes in the first 3 turns unless I have an answer to a cultmaster. In the mulligan keep harrison and a truesilver if you can. My deck seemed to do very well against paladin. Harrison is great against the light’s justice. Otherwise fight for board control and try to run them out of answers. Originally I didn’t even include this because I barely saw it on the ladder but I edited it in due to a request. I ran into something like 3 or 4 control priests during the climb. It wasn’t something I was happy to see and I think it was about a 50/50 match up. Sometimes the priest doesn’t draw enough AOE to deal with your board so you can just run over them, but this is a risky strategy. A couple of those games I felt like they had too many answers and just outvalued me and I ran out of cards and got wrecked by mid sized minions. A few I just walked over them. A notable card here is knife juggler which prevents the 1/3 draw a card priest girl being dropped early and lets you play your early cards. Well that’s it for now. I’ll be interested in people’s views on my card choices and feel free to ask me any questions in the comments.